Test holes are dug w/ a backhoe to a depth determined by native soil type, every site in Dousman will be different. The soil tester will physically and visually evaluate color, consistency, texture, structure, roots and finally signs of bedrock or high groundwater. All of these criteria will determine what type of septic system the soil and state code will support. 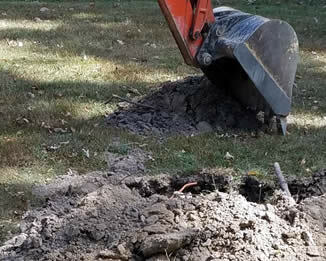 To have us perform a soil test at your property, please give us a call at (262)-495-7004. Associates Soil Testing Inc provides soil testing and perc testing throughout Walworth, Waukesha, Racine and Jefferson Counties. Here are some of the cities we service regularly: Burlington, Delavan, East Troy, Elkhorn, Fort Atkinson, Hebron, Jefferson, Lake Geneva, Mukwonago, Muskego, New Berlin, Palmyra, Rochester, Wales, Walworth, Waterford, Waukesha, Whitewater, and Williams Bay. We also work in Eagle, Big Bend, North Prairie, Burlington and Dousman.